Bhindi bharta or Okra yogurt recipe is a Indian vegetable side dish recipe. Okra is also known as ladies finger/lady's finger. In Indian languages okra is known as bhindi (hindi), bhendi (marathi), bendekai (Kannada), bendakaya (Telugu), vendakkai (Tamil) etc. Mother makes this bhindi bharta with curd (yogurt) which I love. You will like it too if you like bhindi / okra. This is a easy okra recipe and it is served with breads like chapati, roti, nan, bhakri (jowar or bajra roti). As this bharta is served at room temperature or cold, you can make it in advance. Makes a great side dish when you are expecting guests. For this recipe we use tender okra or bhindi. 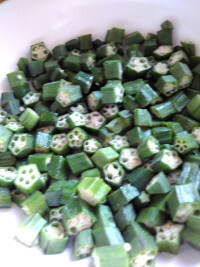 Chop okra / ladies finger / bhindi after cutting the tops. Chop in rounds or small pieces. Add chopped bhindi. Keep heat medium and keep stir frying till the stickiness of bhindi goes away. This will take about 8-10 minutes. Take off flame. Mash a little with the back of a spoon or fork while still warm. Keep aside. Heat remaining oil in a pan. Add mustard and cumin seeds. When they stop spluttering, add split green/red chili, fry for a few seconds. Add hing, curry leaves.Take off fire. Add this to the mashed bhindi. Add curd (yogurt) and salt according to taste. Mix well. Bhindi ka bharta is ready to serve. This is served at room temperature or cold. Serve with nan, paratha, chapatti or bhakri (jowar / sorghum flat bread). Do not cover the pan when you are stir frying bhindi. 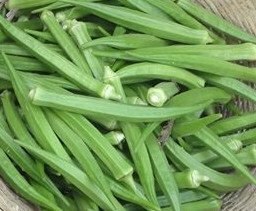 The volume of bhendi reduces almost to half after it is cooked.You can stir fry the okra in large quantity, mash it and keep in the fridge for 2-3 days. Take the desired quantity add the tempering and the yogurt when serving. Saves time. You can store this bharta in the fridge. It will keep for 2 days. If the curd - yogurt is a little sour, add a tablespoon of milk to reduce sourness. You can make this for a party too. 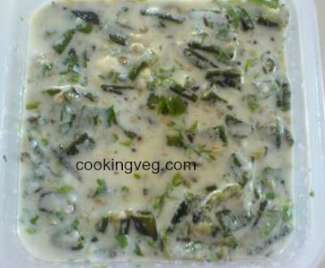 You can fry bhindi and add the tempering and mix and keep till meal time. Add curd before serving. You may add a tbsp of raw chopped onion to the bharta while mixing with curd. You may add 2 tbsp chopped onion to the tempering, fry a little and add to raita. You can also add dry red chili instead of green chili. I am sure you will like this Indian Okra recipe - bhendiche bharit.